Where did this brooch come from? Twilight falls on an ancient Italian plateau. The glowing hearth warms the craftsman's simple oval hut. Melting copper and tin, he forms a wire of bronze. 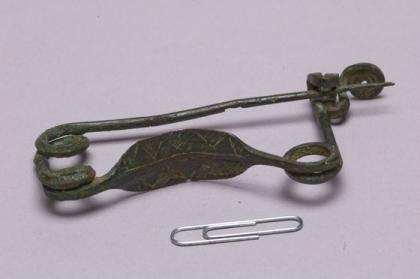 He twists it, flattens and decorates it, repeatedly heating, bending, hammering and cooling the metal to make a brooch. It will serve as a pin, holding his robes together at the shoulder. He pauses to admire his handiwork. Outside, the cattle bleat. Across the barley field, a neighbor experiments with a new metal—iron. The craftsman sniffs. Ugly metal, iron. Sure, it's cheaper than copper and tin, easier to get. But it's so much harder to melt, it takes such high heat. It's weaker than bronze. It corrodes. Bronze has been state-of-the-art technology for 300 years, and always will be. There's no way our beautiful bronze will ever give way to an "iron age." The wind rises, and blows south to the Tiber.